A family-friendly, bright and bustling seafood house with New England flair. 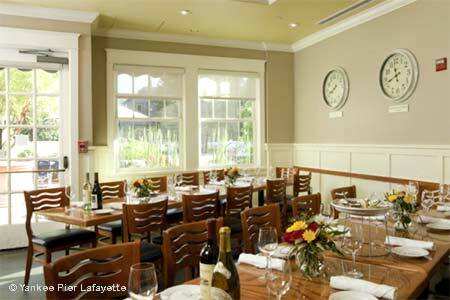 : This jaunty, eminently welcoming member of the Lark Creek Restaurant Group offers the same high standards, eye-poppingly fresh seafood and attentive service as its sisters. Its bright, bustling, nautically themed dining room features a busy exhibition kitchen and vast windows. Using sustainably sourced and largely local fare, chef-partner Michael Dunn crafts classics to please everyone in the family --- as evidenced by the number of loyal local clans who frequent this place. Deceptively simple treasures include chunky clam chowder, grilled Pacific petrale sole and beer-battered fish ‘n’ chips. In the latter, golden crispness coats tender rockfish, with hand-cut Kennebec fries and tangy house-made coleslaw as just-right complements. Vegetarians can forage diverse, generous starters and clever seasonal sides created with care: beer-battered butternut squash spears, huge polenta cake wedges and the aptly titled "Big Fat Buttermilk Biscuit with Red Pepper Jam." Nearly everything is clearly --- and quaintly --- New England-style, but California shows its sunny self in touches such as apple-fennel slaw and lemon aïoli bedding a plump, smoky, juicy Dungeness crab cake. Rich butterscotch pudding sings an irresistible siren song.